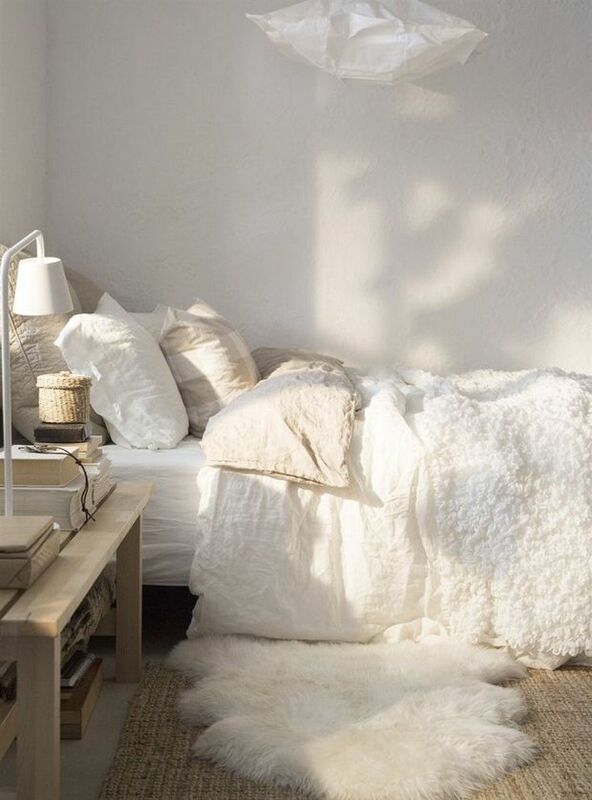 Most of us want our bedroom to be a place of bliss… Cozy, nurturing and relaxing. There are far too few places where one can just be, and can try to let go of the worries and stresses of the day. Shouldn’t your bedroom be one of those places? Easier said than done, it seems like the bedroom is the last place we think about when decorating. After all, we only sleep there, right? Um, no. We recharge, lose ourselves in a good book, cuddle with the kids on a Sunday morning, cuddle with our spouse every night. So let’s make some changes to how we think about bedroom decor, ok? A super nice mattress doesn’t hurt either! These coziest bedrooms for bedroom bliss will get your mind jumping with ideas you can use in your very own home. 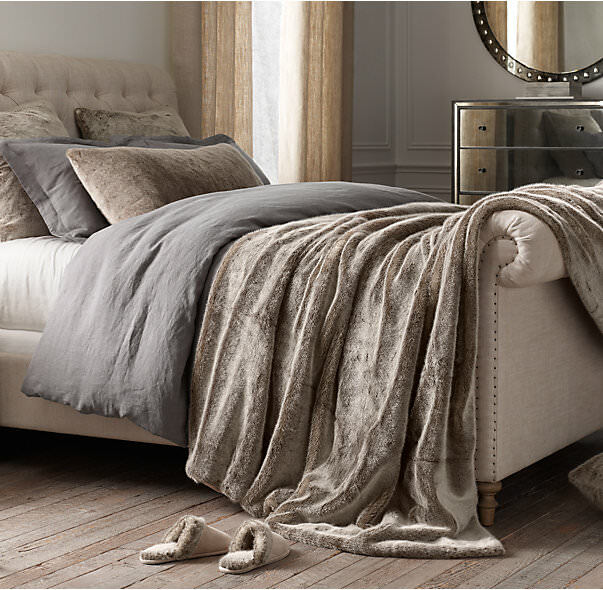 This is the coziest bedroom in gray and beige! Photo below by ‘Restoration Hardware‘. Dark walls and white bedding is a fool proof recipe for a cozy bedroom! The texture on this bed keeps it looking luxe and interesting. BTW, the bedroom and bath are the two rooms in the house you might not want to try to make look larger with light and bright. Rich color on the walls wraps you in psychological security! Photo by ‘Horchow‘. Got kids? Or a guest room made for kids? 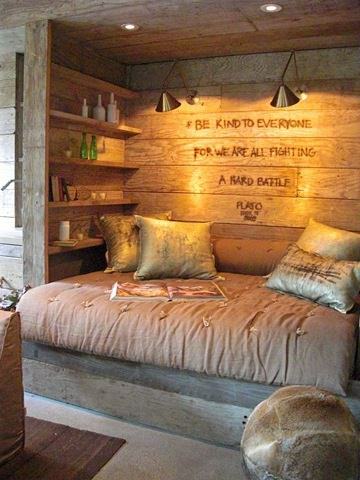 This is an OMG amazing cozy bedroom! The built in nature of the beds, combined with the warm wood makes this. From ‘Architectural Digest‘ and ‘Markham Roberts Design‘. 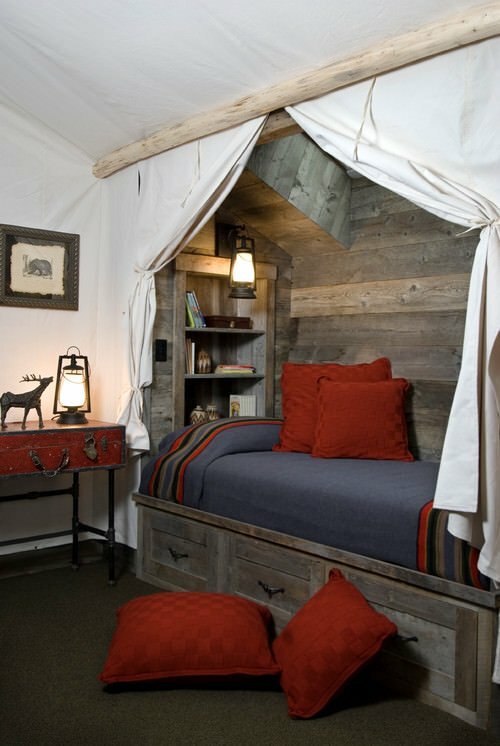 So here is a bedroom perfect for a small home… This nook bed has been placed in an empty closet (to create the “nook”). The cozy factor comes from adding the wood wall and ceiling. Don’t forget the lights! This photo is a Pinterest enigma, can’t seem to find the source! If you know, please share in comments! From ‘Houzz‘, this is great example of using simple fabric panels to create a cozy feel in this little boy’s bedroom. Remember to choose fabric based on the personality of the room! This French country bedroom by ‘Vavoom Emporium‘ shows us how to use accessories to cozy up the place! Lot’s of texture, pillows, and dreamy details! So here is a DIY project for you! 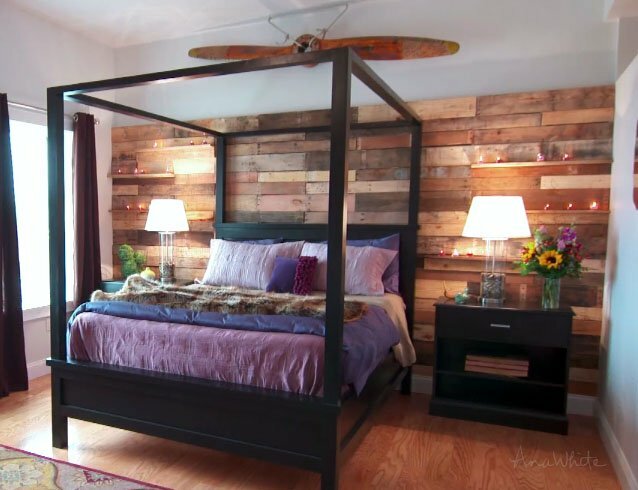 Ana White joined the HGTV “Saving Alaska” crew to show you how to create this cozy pallet wall, without messing up your drywall or making the mistakes that will cause you to regret it! LOVE. THIS. WALL! Ok, let’s face it. 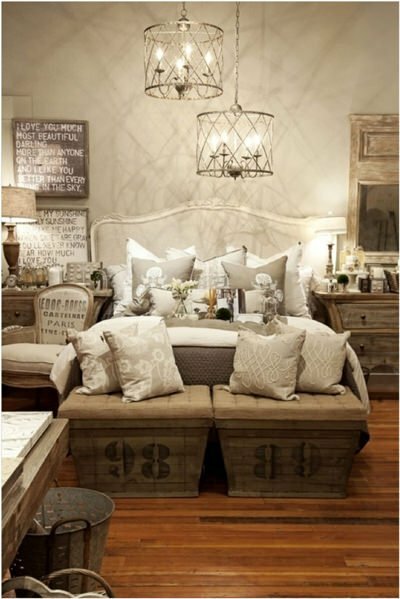 A bedroom is not cozy without a cozy bed, and ‘Pottery Barn‘ know how to make a cozy bed! So they shared this great step by step on how to make a bed, the Pottery Barn Way! This is it, the secret that they use in the stores! Add lights, get cozy! 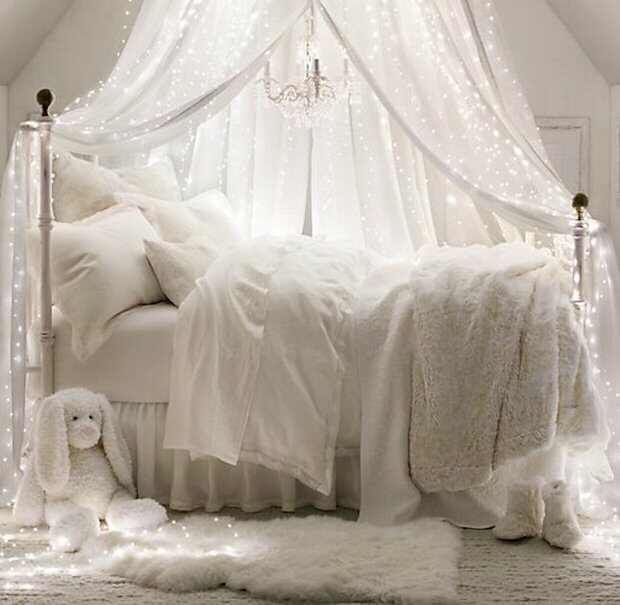 These string lights make this the dreamiest, coziest bedroom extra awesome for anyone! From ‘Restoration Hardware Baby & Child‘. Lastly, if you want to keep that light and bright feel in your small bedroom, we get it. Add lots of textures, and be sure to add a cozy throw rug to the floor. Photo from ‘Ikea Family’.